Guest users are redirected to the default WordPress login page when they try to submit listings from the frontend (unless guest posting is enabled, see Guest Post Settings). However, the design and layout of the default WordPress login page does not match your current theme which may be confusing to some visitors. This is when you can enable the custom login/registration form feature. When enabled, login and registration forms are displayed on a standard WordPress page using the layout of your WordPress theme. Login to your website if not yet logged in and go to the WordPress administration dashboard. Click Directories in the admin sidebar. Show user login form - Whether or not to show a custom login form to guest users. Show user registration form - Whether or not to show a custom registration form to guest users. Note: Make sure user registration is enabled in WordPress (Settings -> General -> Membership), otherwise the registration form will not display even when Yes is selected for this option. 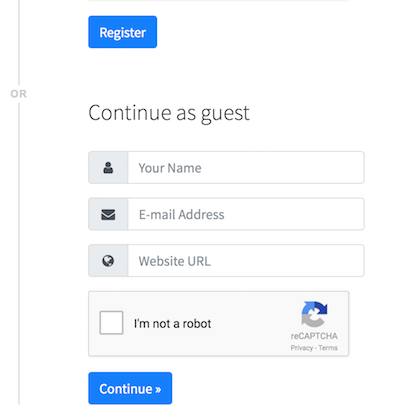 Add reCAPTCHA field (requires reCAPTCHA add-on) - Whether or not to add a CAPTCHA field to the login and registration forms for spam prevention. For more details on reCAPTCHA, see Preventing Spam with reCAPTCHA. Scroll down the page and press Save Changes. In addition, make sure that a valid WordPress page is assigned as the page for displaying the login and registration forms. Click the Pages sub-tab and scroll down to Page Settings. Make sure a valid page is selected for Login/Registration. In case you need to disable the custom login/registration form feature of Directories Pro, simply unselect the currently selected option for the Login/Registration setting under Page Settings. In Directories Pro, you can let visitors submit listings/reviews to your directory without login or registration by granting the Create Listings permission to the Guest user role (see Permissions for details). Collect e-mail address - Whether or not to show an e-mail address field. Require e-mail address - Whether or not to require an e-mail address to be entered. Do not allow e-mail address used by registered users - Whether or not to prevent from entering an e-mail address that is associated with an existing user account. 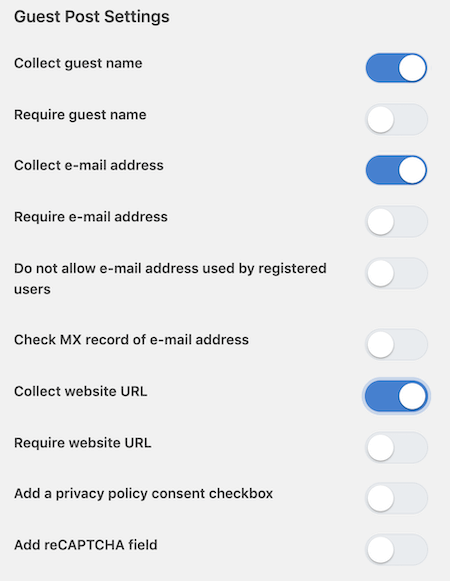 Check MX record of e-mail address - Whether or not to make sure a valid MX record is found for the domain of the e-mail address entered, to prevent fake e-mail addresses. Collect website URL - Whether or not to show a website URL field. Require website URL - Whether or not to require a website URL to be entered. The guest user can then fill out the fields and click the Continue button to proceed to the add listing page. Note: If you have disabled the custom login/registration form feature of Directories Pro, then it is not possible to collect any guest info and therefore all the guest post settings are ignored. In that case, guest posts will be created with the guest name set to "Guest" and all other information empty.